I had some smaller pieces left over from a stump-clearing job I did about 6 mos ago. I cut one piece apart but my table saw kind of ‘burned’ it’s way through it (blade needed replacing) Inside, it looked a lot like a small rosewood variant. 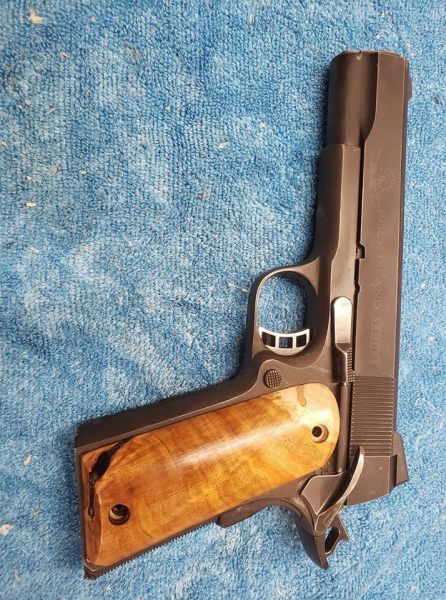 I made a couple small slabs of it and cut/sanded out some grips for my 1911 pistol. It’s a bit of a ‘greasy’ wood so I think stains and coatings won’t work well. I did mine with a simple oil finish. Boiled linseed and a good rub down then finish with a paste wax. So far, I’m liking it. I have been working with wood for many years, turning wood, carving wood as well as boatbuilding and small project crafting. i am always looking for weird, castoff pieces of wood for turning. There is a certain anticipation as a turning takes shape and the grain becomes prominent. I trimmed a limb from a rather large Redbud in my backyard and wrapped it in plastic to prepare for woodturning. When the wood was fresh cut, it was greenish in color, which really surprised me. I split the piece in half to create a bookmatched pair of turnings. The color was pea green, with light to dark brown grain streaks. Several years after turning and finishing, the green has faded to a very pleasant beige, leaving the brown streaks very prominent. How was redbud to work with? Any peculiarities with it? I have redbud wood I’ve been drying from a tree I cut down, and want to work on some projects. Is your wood project still beige? The color of the redbud I have looks similar to a darker mahogany, as it has aged.